I know it's not even October yet, but since I only have a limited time to decorate the house for Halloween I thought I better get started. 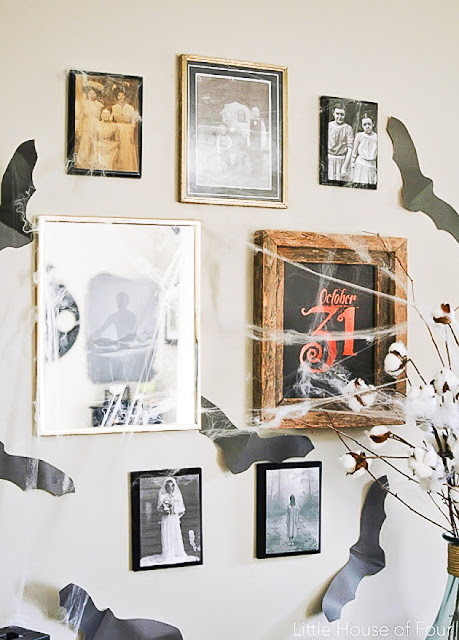 Halloween is such a fun time of year to decorate and go all out with crazy decor. This year, I was inspired by my neighbor who completely transforms her house for Halloween. 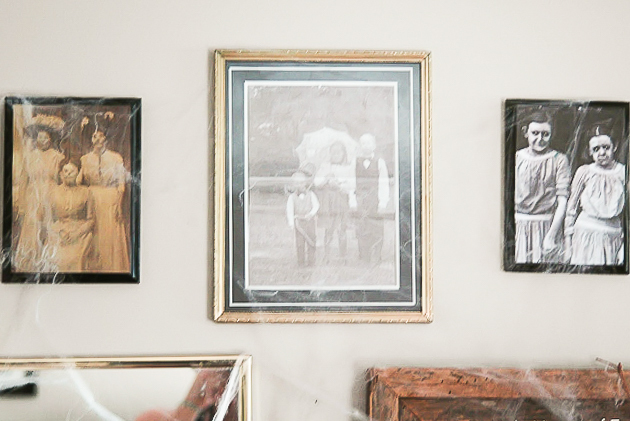 She has an awesome Halloween party every year and turns her house into a serious haunted house. Last year, I walked into the bathroom and there was a human size talking zombie in her shower, scared me half to death! After stopping over her house the other day and being completely blown away by all her Halloween decor I decided I needed to start decorating. 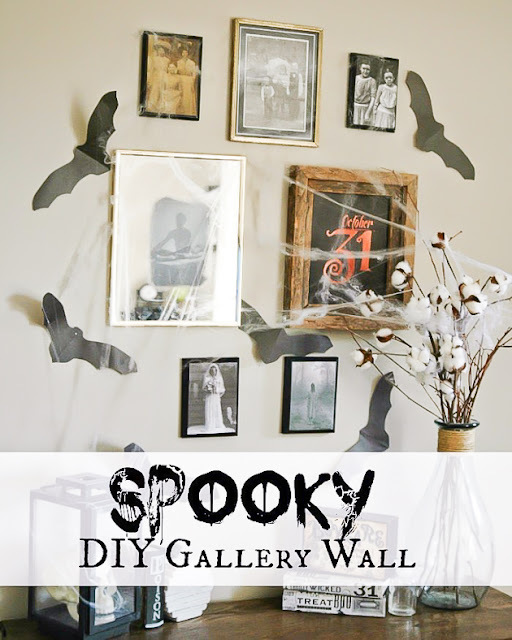 I headed out to Goodwill to get a few items to transform my fall entry table into a spooky Halloween display with gallery wall. I ended up buying a $3.00 mirror, vintage book with a few freaky pictures and 4 small plaques that were $1.00 a piece. 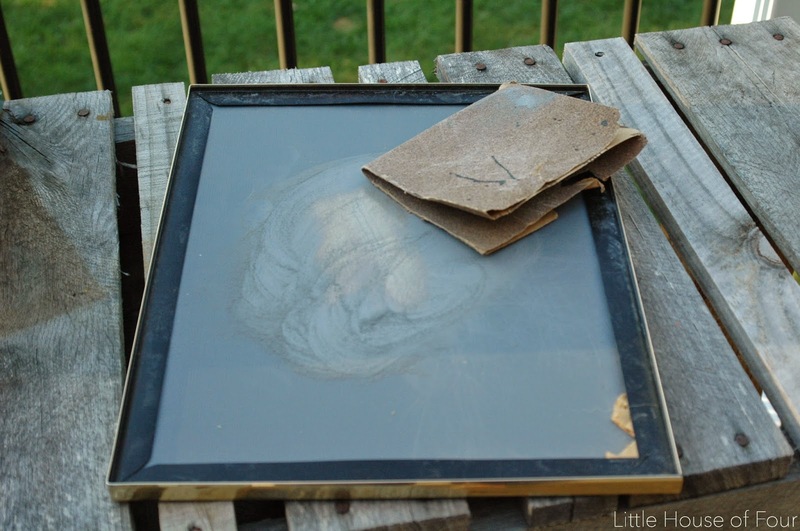 I started by removing the cardboard backing off the frame to expose the back of the mirror. 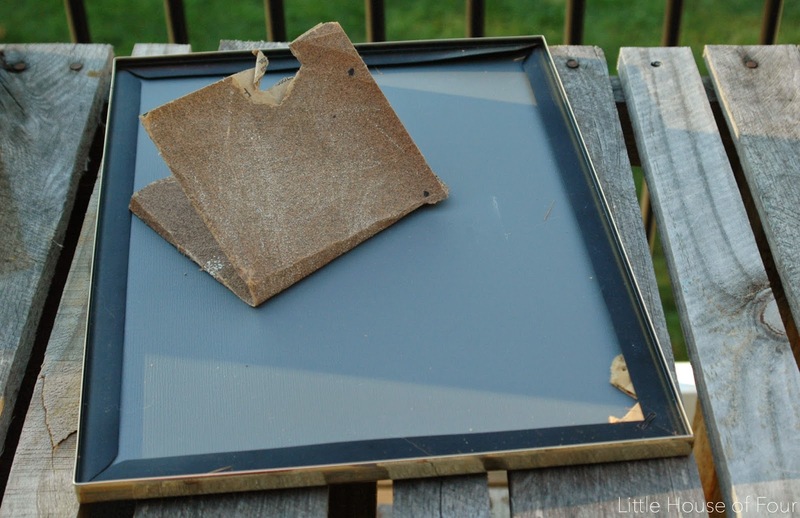 Then I took sandpaper and sanded the heck out of the mirror backing. I'm not gonna lie, this takes some serious sanding and muscle to get through the layers of the mirror. 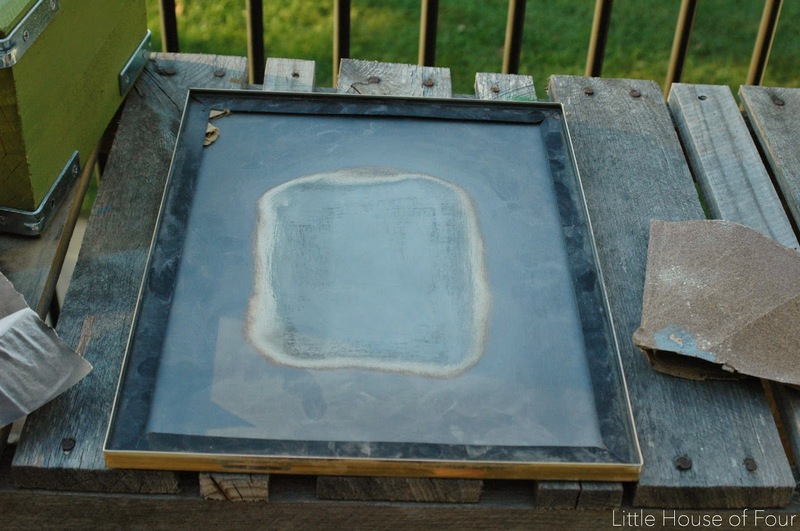 I kept sanding until the mirror turned to glass. 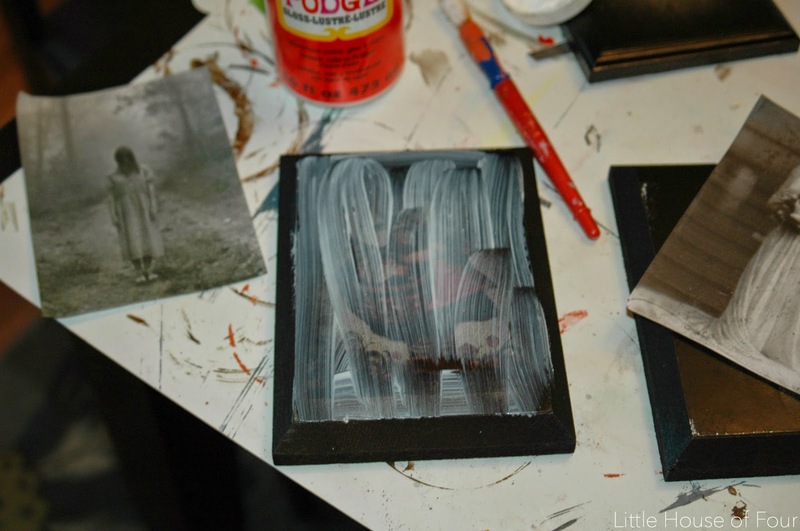 Once I was happy with my sanding I added a spooky picture and it was ready to be hung on the gallery wall. 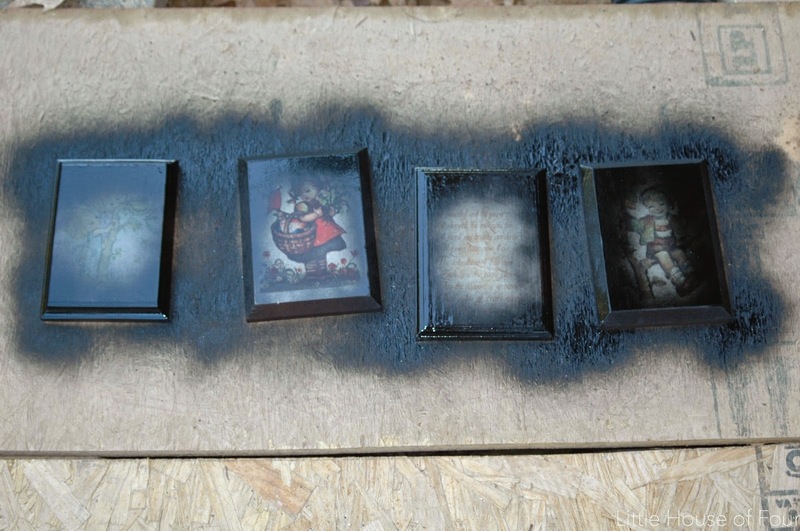 Next it was time to transform the completely dated and not my style plaques into freaky Halloween decor. 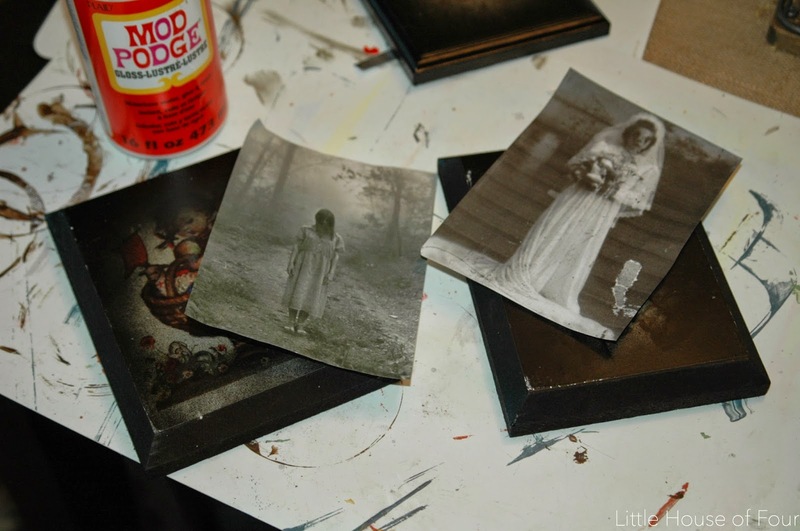 I gave them a few coats of black spray paint then printed out some scary pictures that I added to the plaques with Mod Podge. The addition of a few paper bats and fake comb webs and my entry table was turned into a frightening Halloween display. The kids were a little creeped out by the pictures, but after explaining that they aren't real they quickly moved on and now ignore them. They keep saying how cool the house looks and I have to admit, I'm pretty excited too. My halloween decor is just beginning, so make sure to stop back on October 13th for my full Halloween house tour. I LOVE THIS! great spooky wall! I am going to have to do some of this in my home!! I am having fun looking around your blog! Oh my goodness! SO spooky!!! SO cool!!! 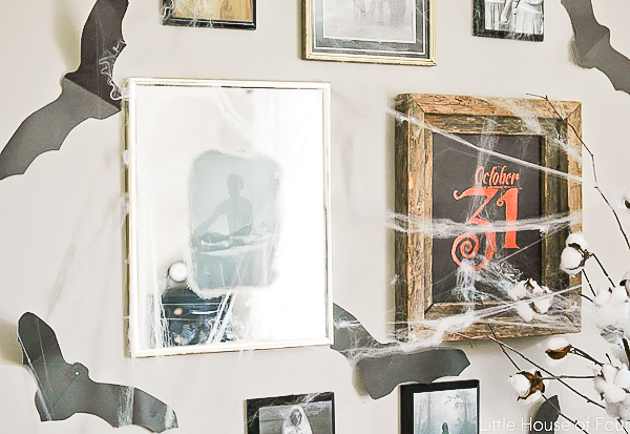 Your display looks amazing, spooky, but oh so classy too - Love it! Super spooky! Thanks for the Halloween inspiration! Those pictures are so creepy! Love what you did with the mirror too..such a cool idea!! Oh my gosh so spooky!! haha. 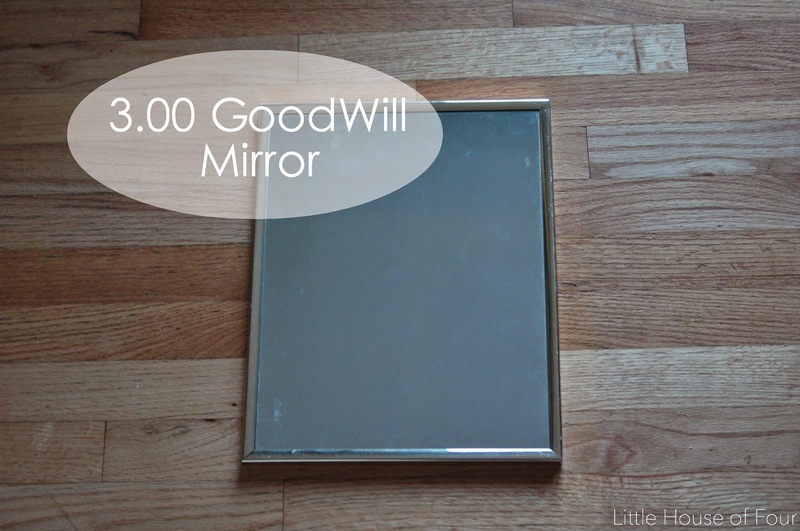 Great mirror tip! I don't decorate for Halloween and typically am not very inspired by Halloween posts, but I LOVE this entire display. 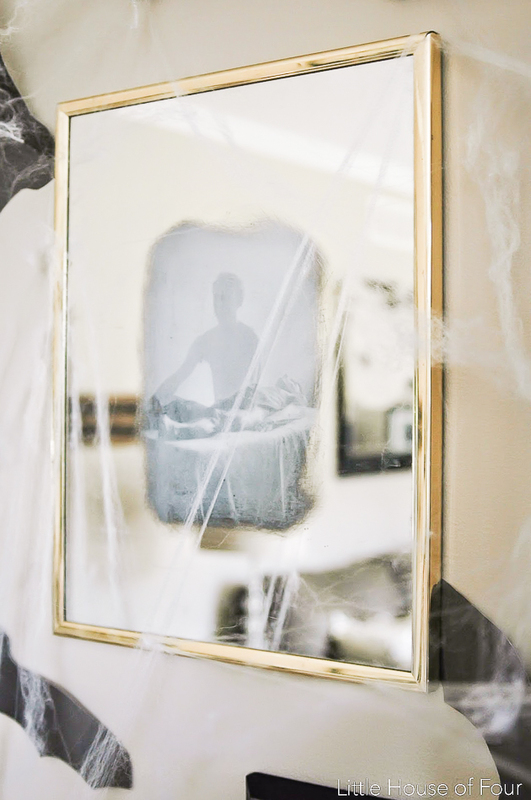 The idea for the mirror with the spooky picture showing through is pure genius! Totally worth the muscle you put into it! Thanks so much for taking the time to link up at our first party this morning! Have a great day! This looks great! You should have your own Halloween party my friend. And also, love the cotton thingies, those will look great at Thanksgiving too. 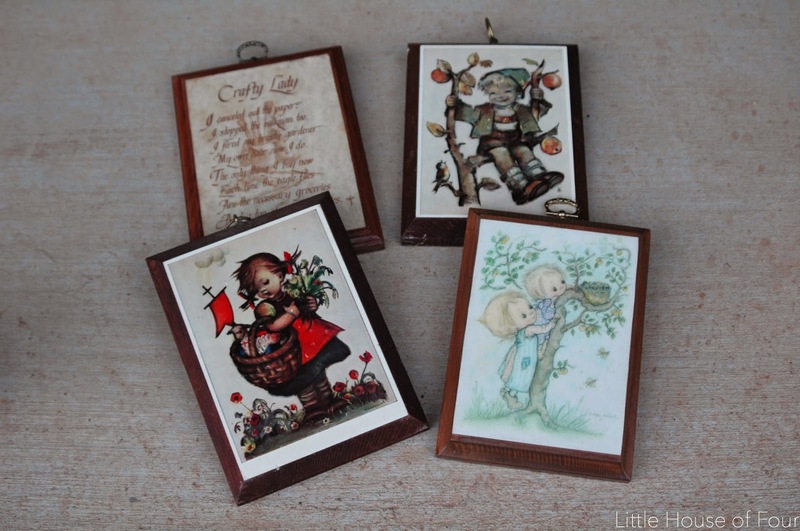 Stopping by from LiveRandomlySimple Totally Terrific Tuesday Link Up Party! Thanks for linking up last week! Party is NOW live, hope you can make it back and link up some more awesome content!! pinned!! I LOVE THIS WALL!! That mirror trick is to cool. I featured you over @ the Think and Make Thursday Link Party.